Historical Horn Courses/Opportunities to study historical horns. We endeavour to keep this list as up to date as possible. Past courses are included in order to give enthusiastic students and idea of what may be available in future years. Please do email info@annekescott.com if you have information on any courses that might be appropriate to include on this list. Natural horn tutor: Teunis van der Zwart. The Ton Koopman Academy is a four day intensive open for musicians currently studying, or having already completed, a Master of Early Music. Participants will receive individual lessons from a leading Early Music specialist in their instrument. Complementary to these individual lessons, participants will be arranged into small chamber ensembles and receive ensemble coaching on key Early Music repertoire. In addition to the practical lessons, participants will take part in discussions under the guidance of Ton Koopman, focusing on questions of research and historical performance practice. At the end of the Academy, the participants will present an informal concert of the repertoire they worked on during the week. The département de musique ancienne of the Conservatoire de Bruxelles are holding another of their' “Mini-stage” courses. The course is open to both experienced early instrument players as well as “first-timers” and is aimed at pre-professional or professional musicians. It offers an ideal opportunity to meet the professors of the department prior to entrance auditions. What are the Horn Days? It is a weekend of masterclasses, rehearsals, concerts and so much more! It is an amazing opportunity to meet new people, discover, learn and share. All horn and music lovers are welcome! - Concerts with music ranging from the 17th to the early 20th century by both faculty and participants. 12th - 19th of August, 2018, Drachten, The Netherlands. Come and spend a unique week in a Carmelite Monastery in Drachten (the Netherlands) from 12 – 19 August 2018 and experience the power of teamwork. What is offered? Chamber music (with intensive coaching), a high-level project orchestra for Beethoven’s 5th symphony, choral workshops, concerts. More information can be found at www.apollo-ensemble.nl. 31 May 2018–3 June 2018, Staufen, Germany. Tutors include Stefan Berrang, Johannes Hinterholzer and Hermann Baumann. Whilst natural horn is not the central focus of this event there are normally a number of events included in this course for the historic instrument. This day course is aimed at horn players with some previous experience of the instrument who are looking to improve their basic "hand technique" skills and competency on the instrument. The course will begin with a refresher on some basic techniques (for example the importance of good intonation with the open harmonics) and move on to finessing the role of the right hand as well as exercises to help pitching and flexibility. This course will also include small and larger scale natural horn ensembles. Course participants ideally will already have their own instruments but a number of instruments can be provided for those without - please enquire at time of booking. More information can be found at www.benslowmusic.org. Natural horn students are needed for "Les Gouts Reunis" course on Haydn's Die Schöpfung. This course is aimed at students enrolled on specialist early music courses with rehearsals taking place 6th - 8th (Moulin d'Ande), 10th - 12th (Nanterre) and two performances on the 13th and 14th of April. More information can be found at www.goutsrenuis.org. Auditions for participants for Two-Year Educational Period April 2018 – April 2020. Auditions to be held in Lodi (Italy) 3 and 4 February, 2018. Theresia Youth Orchestra (TYO) is an international orchestra composed by musicians under 30 years of age coming from the major European schools of early music. Theresia focuses exclusively on the classical music repertoire and promotes its performance on authentic instruments, developing its learning cycles and concert tours around the symphonic works of Haydn, Mozart, Kraus, Boccherini and Beethoven. The full musical program of the orchestra for the next three years is illustrated into a large-scale artistic project, "The Golden Age of Symphony", pointing at the core of the classical music repertoire. The orchestra has been established in January 2012 under a private patronage scheme on the initiative of the Italian entrepreneur Mario Martinoli. More than 600 orchestral training hours, 3 principal conductors, 5 tutors, 110 musicians, 400 applications received from 32 world countries are the numbers that better describe the work that Theresia has done so far. Beyond numbers, the value of Theresia is also witnessed by more than 30 concerts held over the past years in several venues and festivals in Italy - I Concerti del Quirinale, Bolzano Festival Bozen, Sagra Malatestiana, Musiké, Bologna Festival, Trame Sonore, and many others. Theresia is a musical project built around its young musicians. As such, it grew on the belief that the members of the orchestra should also cover the principal musical roles, i.e. concertmaster and soloists. No senior musician plays in the orchestra. The entrust of the orchestra to several conductors, not just one, was another decision that improved the learning experience of its members, enabling them to confront not only with the repertoire but also with different artistic readings and approaches. Claudio Astronio, Chiara Banchini and Alfredo Bernardini are the permanent conductors of the orchestra for the period 2018-2020. From 2016 the orchestra operates under the patronage of the Fondazione iCons, a cultural organisation based in Northern Italy, and has recently developed into a structured educational program: all 35 permanent members of the orchestra receive grants for the duration of one or two years, following educational paths designed to provide them with refined instruments to improve their playing and building a better awareness on the specific features of the classical music repertoire. More information can be found at www.theresia.online. Do you consider studying Early Music at one of the leading Conservatories in the world? Do you want to experience what it really means to study at the Conservatorium van Amsterdam Early Music department? All interested instrumentalists and singers are welcome. More information can be found at www.conservatoriumvanamsterdam.nl. Melbourne Youth Orchestra/Australian Romantic and Classical Orchestra. 8th - 13th of January, 2018. New to Summer School in 2018, MYO is delighted to announce a partnership with the Australian Romantic & Classical Orchestra, presenting an intensive week of historically informed performance practice workshops and lectures, culminating in a public performance at the end of the week. Led by Australian Romantic & Classical Orchestra’s concertmaster, internationally renowned Australian violinist, director and concertmaster, Rachael Beesley, and principal clarinet Nicole van Bruggen, the MYO Summer School Young Mannheim Symphonists program will ensure participants are able to work with and learn from some of Australia’s most respected musicians in historically informed performance practice. Designed to give students the unique opportunity to delve into Classical and Romantic performance styles, participants will explore both the theoretical and practical aspects of performing Schubert’s mighty Eighth Symphony (‘Unfinished’), along with Haydn’s ‘London’ Symphony and Mozart’s ‘Haffner’ Symphony. The Music Campus RheinMain-Period Music-Orchestra is a forum for young artists of classical music and presents orchestral projects in historical performance practice. Renowned professors of the instrumental groups high strings, deep strings, woodwinds and brass instruments, who also play in the orchestra, work together with young elite of the classical scene to work out large orchestral works of the 18th and 19th centuries. The tuning is 430 Hz. The period is Thursday-Sunday, 16th -19th November 2017 and is divided into 2 rehearsal- and 2 concert days. The concerts will be held in the town parish church of Miltenberg on Sat., 18th November, 7.30 pm, and in the pilgrimage church of Alzenau-Kälberau on Sunday, November 19th, 3.30 pm. For further information contact Ms Sara Bernhardt bellartefrm@t-online.de or visit www.bellarte-frm.de. Strasbourg (CRR) : 2 June, 2017. ALSO NB: whilst this course is advertised as open to baroque horn players I noted that the programme for the course doesn't actually include repertoire for horns. Maybe enquire before applying! The Summer School of the »International Mendelssohn Festival« takes place for the eleventh time from September 11 – 24, 2017. Renowned artists hold Master Classes (Violin, Viola, Cello, Flute, Oboe, Clarinet, Horn, Saxophone, Conducting and Chamber Music) and perform in concerts at the Hochschule for Music and Theater Hamburg. Highly qualified music students from four continents will come together in Hamburg for two weeks of Master Classes to put their musical skills to the test and to further refine their playing under professional guidance. An illustrious team of instructors comprised of internationally renowned professors will coach students during this period. Boxwood and Brass are delighted to be returning to Benslow for their third Harmoniemusik course. Explore the wind ensemble music of Vienna and Bohemia 1780-1820 on this brand new course in the Benslow Music programme. Period-instrument specialists from Boxwood & Brass will guide you through works by Mozart, Beethoven and Krommer as well as historical transcriptions of operatic and symphonic music. There will be a workshop for players of natural horn and those interested to try it! We are looking for oboe, clarinet, bassoon and horn players of a confident grade 6 to conservatoire level, on modern and/or period instruments (A=430 or 440). Students will leave with a broader knowledge of the repertoire for harmonie and the ensemble playing skills it requires, with a particular emphasis on opera transcriptions. You will also have the chance to learn the basics of classical period performing style and hear or try period instruments. The course will be open to both individuals and existing ensembles, and will be open to string players, pianists, and wind players (including horn). At least two pianos, an 1830s Streicher with an Anglo-Viennese action, and a late 19th-century French piano by Erard will be available. Three public concerts will be given by tutors, visiting artists, and – in the final concert – course participants. The concerts will take place in a number of historic Oxford locations including The Holywell Music Room and St Peter’s College Chapel. This one-day natural horn course will welcome all horn players who've always wanted to try out the natural horn as well as enthusiasts with some previous experience of the instrument who are looking to improve their basic "hand technique" skills. The course will focus on a number of horn ensemble works, including some from the massed "trompe de chasse" repertoire which focus on the natural harmonics of the instrument. This course will offer the chance for complete beginners to have their first go on the natural horn and, for those with a little more experience, the opportunity to focus on the core skills that are needed for natural horn playing in order to build up confidence and ultimately the enjoyment of the instrument! Course participants ideally will already have their own instruments but a number of instruments can be provided for those without - please enquire at time of booking. Course contents: A special feature of the historical performance practice is the orchestral play without a conductor. This course provides interpretative approaches and playing techniques of the historical performance practice as well as the elaboration of complex classical compositions without a conductor. At the end of this masterclass there will be a concert. Individual lessons and register samples intensify the content. Complementary lectures on the topic of intonation, bow construction and ensemble management round off the course. The pitch of the course is 430 HZ. Note: Students can apply Credit Points for this course at their music college. Who can apply? Apollo Summer Academy courses are offered at various levels (A, B & C) in order to provide students with an optimal challenge at their own level. The Summer Academy is open to individual participants and pre-existing ensembles alike. Another edition of the Harmoniemusik summer course with Xenia Löffler (oboe), Ernst Schlader (clarinet), Christian Beuse (bassoon) and Teunis van der Zwart (horn) in the beautiful and inspiring surrounding of Kloster Michaelstein from 24th to 28th of July 2017! The course is aimed at horn players of ever level, those interested in a first approach to the natural horn (baroque and classical) as well as to students and young professionals who have already begun to study these instruments that want to deepen their understanding of solo, chamber and orchestral repertoire. The course will focus on the history of the instrument and its technical evolution which goes hand in hand with musical evolution: starting with the historical treatises and the methods written by the horn players of the time, through learning of the musical practices and working on the appropriate technique, a conscious approach to the interpretation of the baroque, classical and first romance repertoire, with particular attention to the concerts of Vivaldi and Telemann, the Brandenburg Concerto and Bach Cantatsa, concerts and symphonies of Haydn, concerts and chamber music of Mozart , Beethoven's Sonata and his orchestral repertoire, Schubert's "Auf dem Strom" lied, Brahms's horn, violin and violin trio and his symphonies. The tutor will provide a classical natural horn for beginners to have a direct approach to the instrument. French ensemble Les Siècles are running a course alongside the Berlioz Festival in La Côte-Saint-André. The JOEHB is calling for students aged 18 - 30 who are currently enrolled in either any of the conservatoire supérieurs, CNSM Paris or Lyon, any "Grand European Conservatoires" or are at the end of the 3rd or 4th cycle at CRR or CRD. Based in Dublin at the Royal Irish Academy of Music on Westland Row in Dublin City Centre, Dublin Brass Week promises you a packed schedule of events with a world-class faculty in a relaxed and enjoyable atmosphere. You can participate in Dublin Brass Week 2017 as either an Active Participant or a Passive Participant. Active Participants will perform in masterclasses, individual lessons and concerts with our faculty of leading soloists and internationally renowned teachers. Additionally there will be ensembles and orchestral audition training classes. Active Participants may also take part in the Dublin Brass Week 2017 Concerto Competition.An audio submission of exposition (or up to 3 minutes) of your chosen concerto will required as the 1st round pre-selection. The public Final of DBW17 Concerto Competition will be held at DBW17. Active Participants should be 18 years and over and be undergraduate or postgraduate students, recent graduates, or professionals. Dublin Brass Week will run from Monday 26th - Thursday 29th June 2017. Active participants are required to be available from 10am until late evening on all these dates. Natural horn specialists include: Prof. Hermann Baumann, Prof. Johannes Hinterholzer and Stefan Berrang. This famous horn event is celebrating its 20th anniversary in 2017. Whilst natural horn is not the central focus of the event there are normally a number of events for the instrument. This workshop is open to professionals, students, teachers and advanced amateurs interested in the natural horn. The schedule will include a daily master class, an ensemble session, and a lecture. Each student will receive two private lessons during the week. An informal concert will conclude the workshop. For participants who do not own an instrument, a limited number of horns will be available. On Saturday the 27th May in the Royal Irish Academy of Music, there will be a concert at 12pm featuring the Natural Horn. Pupils and alumni will perform pieces by Beethoven, Mozart, Reicha and Kling to name but a few. From hardened pros to natural horn babies, this is the first concert of it's kind in Ireland and there might even be a chance for you to join in if you like! So bring along your horn at 11 am for a rehearsal (even if it has valves) and bring along your family for 12 pm. Oh, and it's free. 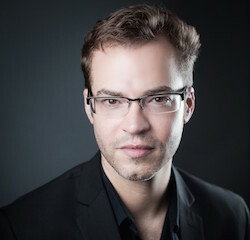 We will feature Jeroen Billiet from Belgium as our visiting expert and soloist. Be amazed! Aimed at pre-professional and professional musicians, both modern and baroque. The course will focus on historic instruments and there is the possibility of borrowing instruments during the course (please request this when booking). The course will take a maximum of five students per faculty and will involve masterclasses, individual lessons and chamber music. It is possible to attend for one day but chamber music is only possible for those attending for the whole course. 1st – 4th of March 2017. Private natural horn lessons, chamber music opportunities (horn and fortepiano, wind divertimenti, etc.) and orchestra. More information can be found here. This project is aimed at young professional musicians, students and graduates of conservatoires. the participants will receive a daily rate of €100, travel costs and accomodation will be provided by Bell'Arte Frankfurt RheinMain. Interested musicians must submit a registration form, and a short musical Curriculum Vitae, plus are able to send in CD recordings. Natural horn tutors: Pip Eastop and Raul Diaz. Those interested can request information or confirm your presence by contacting Angels Gámez by email (click here). This one-day natural horn course will welcome all horn players who've always wanted to try out the natural horn as well as enthusiasts with previous experience of the instrument who are looking to improve their "hand technique" skills. The course will focus on a number of horn ensemble works, from the massed "trompe de chasse" repertoire for the absolute beginners to some more complex works from the French school for those looking for more of a challenge. Course participants ideally will already have their own instruments but a number of instruments can be provided for those without - please enquire at time of booking. More information can be found at http://www.benslowmusic.org. Boxwood and Brass are delighted to be returning to Benslow for their second Harmoniemusik course. Explore the wind ensemble music of Vienna and Bohemia 1780-1820 on this brand new course in the Benslow Music programme. Period-instrument specialists from Boxwood & Brass will guide you through works by Mozart, Beethoven and Krommer as well as historical transcriptions of operatic and symphonic music. There will be a workshop for players of natural horn and those interested to try it! We are looking for oboe, clarinet, bassoon and horn players of a confident grade 6 to conservatoire level, on modern and/or period instruments (A=430 or 440). Students will leave with a broader knowledge of the repertoire for harmonie and the ensemble playing skills it requires, with a particular emphasis on opera transcriptions. You will also have the chance to learn the basics of classical period performing style and hear or try period instruments. An opportunity to learn more about the natural horn - designed for students of any age and level who are interested in expanding their knowledge of this instrument. There's no need to have a natural horn to participate in this course, simply come with your own horn. The teacher, Gilbert Cami Farràs will be able to provide students with two natural horns during the course. The course will focus on solo, ensemble and orchestral repertoire written for the instrument. There will be daily "warm up exercises" using the natural horn methods written by horn players of the eighteenth and nineteenth centuries. The course will discuss the different classifications (cor alto, cor basso, cor mixte) given to horn players and will explore the evolution of the instrument throughout the history of music. To end the course there will be a closing concert followed by port! For more information contact Gilbert Cami Farràs here. 2016 Theme - Music at the Dresden Court. This is what the Austria Barock Akademie imparts to students of any age from all over the world. The joy of music is what is given prominence to especially in the popular summer master classes held by a team of international high-profile instructors. It is our passion to pass on the musical creations of the baroque times on a raised standard and to create curiosity." A course for clarinetists, bassonists, oboists, flautists, recorder players, natural horn players and keyboard players who which to start or improve their knowledge of historical interpretation. This course includes lectures, concerts, tours, guided tours and recreational activites in the city of Ourense and surroundings. Registration: 180€ (full course), partial course (60€ per day). For more information and pre-registration please contact: cursomusicaorense@gmail.com. Natural horn and early valve horn summer course in Madrid. Instruments available for those who do not have their own. Course is open to everyone - beginners through to advanced students. The Berwick Academy is one of the few educational performance opportunities in the US that exclusively features period performance. Faculty and directors are all top performers and educators in the field. Students will get unparalleled experience by working and living side-by-side with these artists and musicians like themselves. More information can be found at www.oregonbachfestival.com. Two students from the Conservatorium van Amsterdam are organising an introduction to the natural horn at the Conservatorium (Oosterdokskade 151, 1011 DL, Amsterdam). They describe it as a "crazy, suprising, mind-blowing, spectacular and revolutionary Natural Horn introduction to anyone (ANYONE, your grandmother, daugher, neighbour, dentist...) interested. "They will provide instruments to try, duets and "carrots". More information here on their facebook event page. The Theresia Youth Baroque Orchestra (TYBO) organises from 4th to 7th May 2016 in Venice its yearly Auditions & Workshops to select new musicians that will take part in TYBO’s musical stages and orchestral projects in 2016-2019. The TYBO Auditions & Workshops will focus on classical chamber and orchestral music and will be held by the three principal conductors of TYBO: Claudio Astronio, Chiara Banchini and Alfredo Bernardini. The TYBO Auditions & Workshops 2016 will consist in a series of ensemble and orchestral master classes held by TYBO principal conductors and focusing on chamber and orchestral music of the Classical Era, including Boccherini, Mozart, Haydn, Kraus and others (A=430 Hz). The detailed program and the musical parts / scores will be sent to admitted applicants by mid-April 2016. The Auditions & Workshops are open to a maximum number of 35 (thirty-five) musicians, chosen by the Selection Committee on the basis of the submitted application data. This will include four horns. The Auditions & Workshops are open to professional musicians – including advanced students – born after 1st January 1988. In-depth knowledge of performance praxis on authentic instruments is a mandatory requirement. The use of authentic instruments or copies of authentic instrument is a mandatory requirement. The use of classical instruments is warmly recommended by the Organisation and the Selection Committee. More information can be found at www.theresia-project.eu. L’orchestre des « Goûts Réunis » associe pour chacune de ses productions , professionnels de renom et instrumentistes étudiant la musique ancienne au sein des principaux établissements français et européens (CNSM, CRR, CRD ou CRC, etc.). Le diapason des productions peut-être 415, 392 ou 430 Hz. Le travail commun permet à la fois un partage des connaissances et une « mise en situation » des instrumentistes qui sont ainsi confrontés aux circonstances particulières de la production publique d’une grande œuvre. Le diapason utilisé est 415 Hz. The timetable will include lessons in the morning (9.30 - 1.30) and chamber music in the afternoon. The course will culminate in two concerts. The Historic Brass concert on the Friday and the Winter Academy concert on the Saturday (program to include the Handel Fireworks Music and a Haydn symphony). Also insturment builders Daniel Kunst and Juhász Zoltán will be exhibiting their instruments. For more info and registration contact Almut Heibult. Explore the wind ensemble music of Vienna and Bohemia 1780-1820 on this brand new course in the Benslow Music programme. Period-instrument specialists from Boxwood & Brass will guide you through works by Mozart, Beethoven and Krommer as well as historical transcriptions of operatic and symphonic music. There will be a workshop for players of natural horn and those interested to try it! We are looking for oboe, clarinet, bassoon and horn players of a confident grade 6 to conservatoire level, on modern and/or period instruments (A=430 or 440). Students will leave with a broader knowledge of the repertoire for harmonie and the ensemble playing skills it requires, with a particular emphasis on opera transcriptions. You will also have the chance to learn the basics of classical period performing style and hear or try period instruments. The new programme of the Ensemble Academy Freiburg 2015 is released! ensemble recherche and Freiburg Baroque Orchestra are offering again master classes on the performance practice of historical and contemporary music for advanced students and professional musicians. The Freiburg Baroque Orchestra will offer an orchestra course accompanied by single tuition. Please note that we can only register applicants that show former experience in playing on historical instruments. It is a precondition to bring a baroque instrument of historical construction (the only exception is the harpsichord). 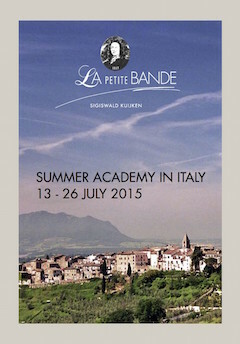 For the first time, La Petite Bande organizes a Summer Academy on historical musical and scenic performing practice of MOZART and HAYDN, from July 13th – 26th 2015, which will take place in a beautiful old monastery outside the village of Collevecchio, 70 kilometers to the north of Rome, Italy. The Academy will be led by Sigiswald Kuijken (musical performing practice) and his daughter Marie Kuijken (scenic performing practice). Every participant has the possibility to be coached individually by both of them, as well as to receive coaching on chamber music, together with other participants. Aston Magna and Brandeis University are pleased to announce their sixth annual Classical Winds and Harmonie Ensemble Workshop with Stephen Hammer, oboes; Eric Hoeprich, clarinets; Andrew Schwartz, bassoons, and Todd Williams, horn. The workshop will be held June 28-July 3, 2015 at the Slosberg Music Center at Brandeis University, supplementing the Aston Magna festival concerts. The Academy is designed for advanced young musicians specializing in historical performance practice, i.e. orchestra musicians and soloists at the start of their career who are familiar with the basic components of historical music performance. Learn and practice the various playing techniques on the narrow-bore “Baroque” horn using various dampers and open blowing (with or without correction holes) and the discussion resulting from this concerning the various phrasing possibilities directly related to the “pure” natural harmonics. Practicing examples of horn literature from the well known works of Bach and Handel, as well as the later repertoire for the classical ‘damping technique’ of the so-called “Invention” horn.